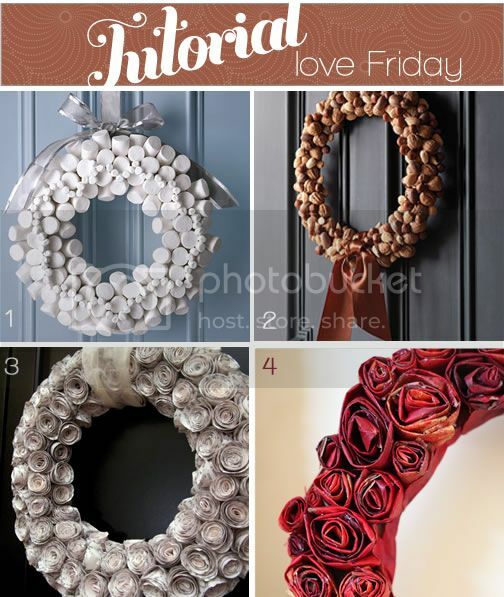 For this week I wanted to share my favorite wreath projects, so creative and so beautiful. I love every single one of them so I know you will too! I hope everyone have a wonderful weekend, I will see you Monday! WOW! I love that rolled recycled paper wreath! That marshmellow one is so unique! And I’ve recently seen the nut one from MS but I hear it’s a lil heavy. The marshmallow wreath is adorable. Thank you for sharing these! I just found you. You have some great ideas and I want to keep up! I’m adding a link to your blog on my sidebar. the 3rd tutorial is awesome… i loveee using print in creative ways! These are beautiful! I especially love the marshmallow wreath! What pretty wreaths + it looks like you had a fabulous vacation! blessings.